Investors are taking the latest batch of weak economic reports with a grain of snow-melting salt. 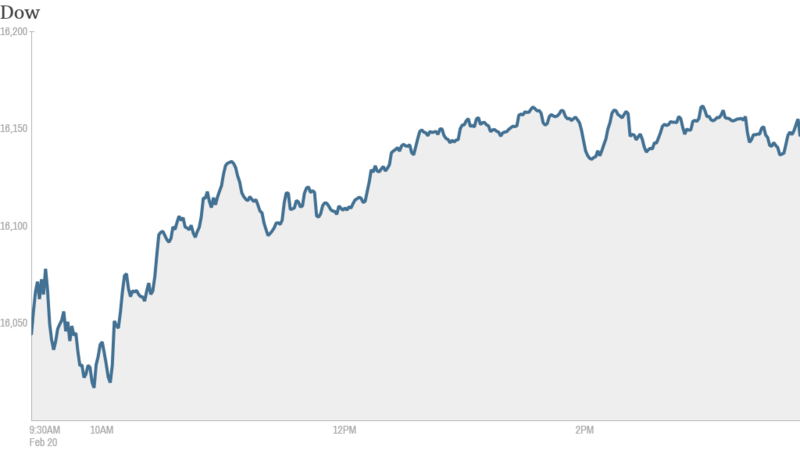 The Dow Jones industrial average gained more than 100 points. The S&P 500 closed within 10 points of its all-time high. The Nasdaq also gained, resuming a hot streak. The tech-heavy index has closed higher in 9 of the past 10 trading days. The U.S. government said the consumer price index, the benchmark for inflation, rose 0.1% in January, which was slightly below what economists had predicted. A measure of manufacturing activity in the Philadelphia area fell sharply. On the bright side, initial claims for unemployment benefits fell last week. Lackluster readings on manufacturing in China and Europe weren't making investors nervous either. Some traders said stocks were benefiting from a move out of bonds as investors look for more risky assets. The yield on the 10-year Treasury note rose to 2.77%, up from 2.74% Wednesday. Bond yields rise when prices fall. Investors are still digesting meeting minutes released Wednesday by the Federal Reserve. While the Fed remains set on holding interest rates low for now, a few officials raised the possibility of increasing rates "relatively soon." Facebook's $19 billion bet on texting. The market was buzzing with chatter about Facebook, which announced plans Wednesday to buy messaging platform WhatsApp for $19 billion in cash and stock. Despite the eye-popping price tag, analysts say the deal makes sense. WhatsApp gives Facebook access to the global text-messaging market, which should help the social network retain its younger users. Analysts at Goldman Sachs said they believed the acquisition "will help drive increased engagement." "Facebook could not risk WhatsApp's 450 million monthly and 315 million daily active users falling into the hands of a competitor, such as Google," he said. Google (GOOG) reportedly offered to buy WhatsApp for $10 billion, but was rebuffed. Still, not all investors are convinced the move is wise. Some traders on StockTwits criticized Facebook for the deal, which includes $4 billion in cash, $12 billion in stock and another $3 billion in grants. "$FB paying $16 billion for an app $GOOG only wanted to pay $10 for? bad management = lower prices here for $FB stock under $60 coming," said StockTwits user UPB. Facebook shares rose more than 3% to trade near $70 on Thursday. Another trader believes the tech industry may be losing touch with reality. "$FB already inflated stock is being used to buy another surreal valuation firm. reality strikes eventually. Remember all 1999 acquisitions?" said amigobulls. BlackBerry has a text service too. The WhatsApp deal raised speculation that other companies with text-messaging services might be able to cash in as well. Shares of the troubled smartphone maker BlackBerry (BBRY), which operates the BBM messaging service, were up nearly 5%. Interestingly, BlackBerry and Facebook are the two best-performing stocks in CNNMoney's Tech 30 index this year. There was a lot of talk on StockTwits about what new BlackBerry CEO John Chen will do with BBM. One trader took a very bold swipe at WhatsApp. "$BBRY to think BBM is 10X better then what'scrap and being valued at $0. Chen you are the man to bring the value," said tonycr. "$BBRY All it takes is for Chen to separate the four businesses and this stock will sky rocket. Simple as that," said duke2duke. 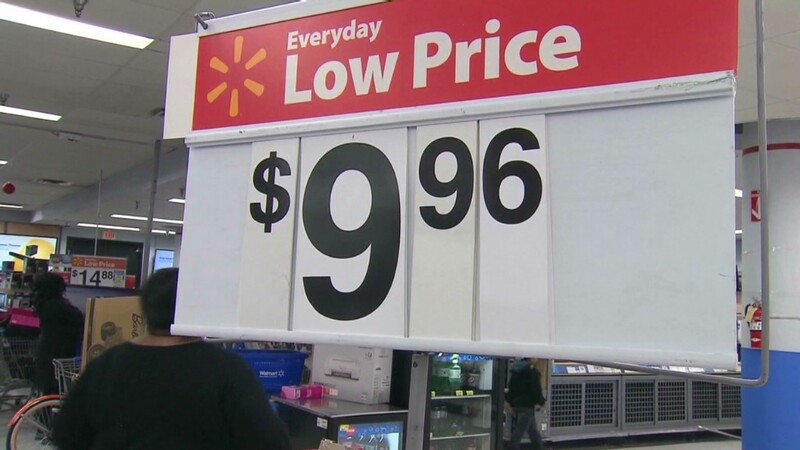 Wal-Mart (WMT) reported quarterly results that topped expectations, but shares of the retail chain fell after it warned that "economic factors" would weigh on sales this year. Tesla (TSLA) shares soared to a new all-time high after the company reported much stronger than expected profits and said it will sell 55% more vehicles this year than in 2013. Shares in BAE Systems (BAESF) were down after the defense contractor warned that U.S. budget cuts would hurt earnings in 2014. Safeway (SWY) shares gained after the supermarket chain's management announced they are in talks to sell the company. Shares of DirecTV (DTV) were up after the company announced plans to repurchase $3.5 billion of its own stock. Actavis (ACT) shares were up after it said earnings doubled in the fourth quarter. The company announced plans earlier this week to buy Forest Laboratories (FRX) for $25 billion. Forest shares were also higher. After the market closed, Hewlett-Packard (HPQ) reported better-than-expected quarterly earnings and issued an upbeat outlook. The stock was flat in extended trading. Groupon (GRPN) and Priceline.com (PCLN) both reported results that topped analysts' expectations. Both shares soared initially after hours but later pulled back. European markets ended mixed. Most Asian markets closed with losses. HSBC's preliminary reading of Chinese manufacturing activity fell to a seven-month low in February. A survey of European purchasing managers also came in weaker than analysts were expecting.